Troop 316 meets on Tuesday nights from 7:00 to 8:30 pm in the Fellowship Hall of St. Andrew the Apostle Catholic Church, which is located at 3008 Old Raleigh Road in Apex, North Carolina. We are always looking for young men interested in joining our troop. You can find a presentation by Frank Jackson summarizing our history of our unit on YouTube. 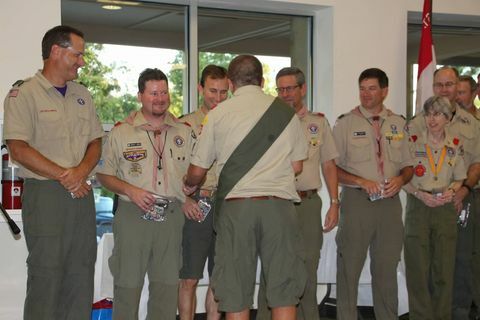 Our own Frank Jackson was presented the Distinguished Owl Award by Tom Taylor at the October 23rd Troop meeting. Troop elections are right around the corner. This document has some brief descriptions of the youth positions for your consideration. Did you know that there is a place where you can post buy/sell/trade/free scouting related items (such as uniforms, etc.) on the Troop website? The direct link is https://www.t316apex.org/node/1838 or you can access it from the left hand side menu under Troop Bulletin Board. New scout year means new forms to fill out -- Yeah! Its a new Scout year, which means its time to make sure your paperwork is updated. All scouts need to complete the 2018 Permission Form. In addition, both adults and youth who wish to camp with the unit must have updated BSA Medical Forms (Parts A&B) and insurance cards. When turning in receipts for expenses - please email a scanned copy of the receipts, or take a legible picture of the receipt with your phone and send that to Troop Treasurer Chris Shugg. Include an explanation of the expense, and he will do his best to have a check ready for you at the next meeting. The Troop handbook has been revised. It is also now located online here.